We sincerely invite the game industrial professionals registered as trade visitor to join Taipei Game Show 2019 B2B Zone & Asia Pacific Game Summit. The organizer reserves the right to review the application, and will send the result by email within 10 working days. 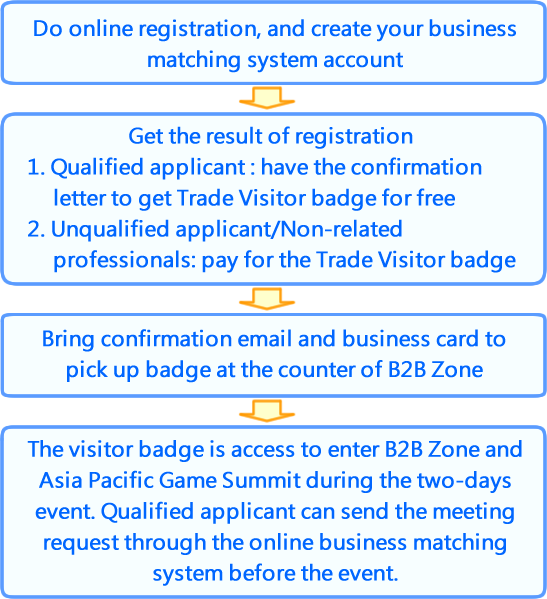 Qualified applicant will receive the confirmation letter to have the Trade Visitor badge for free, enable to send meeting request to exhibitors through the online business matching system by the summited account ID and Password, and access to attend Asia Pacific Game Summit (Limited seats, first come first served.). Unqualified applicant need to pay for the Visitor badge. *Game industrial includes Art Development , Game Development , Publisher/Agency, IP Licensing, Advertisement, Digital Media Marketing, Event Management, Hardware, Software, Platform, Payment, Localization, Venture Capital, Crowd-funding platform. ★ Each badge is allowed to enter B2B Zone and Asia Pacific Game Summit during Jan. 24 to 25, and be used as a one-day pass to enter B2C Zone on Jan. 25, 2019. ★ Please note that each badge is registered and nontransferable. Organizer reserves the right to conduct suitable trade visitor inspections on site. No cancellation, refundable and exchanges to cash by any reason. No reissued if lost. The organizer has the rights to cancel the admission of unqualified applicants. People under 18 years of age will not be admitted into showground. The organizer reserves the right to modify, to insert, and/or to withdraw any part of the rules specified herein.